JASP is available for Mac OS X, version 10.10 (Yosemite) and above (Which version do I have?). JASP is installed by downloading and double clicking the .dmg file, and dragging the JASP icon to the Applications folder. This places JASP in your applications folder. OS X actively discourages people from downloading software from the internet (rather wanting to channel people through their app store), so there will likely be some additional steps to make JASP run. Newer versions of OS X need to have their “Gatekeeper” options relaxed, before they will allow software to be used that was downloaded from the internet (more info). You will need to change your Gatekeeper settings to “Allow applications downloaded from anywhere”. Having relaxed the Gatekeeper settings, the next step is to ‘right click’ or ‘control-click’ JASP in your Applications directory, and select ‘Open’ from the menu. 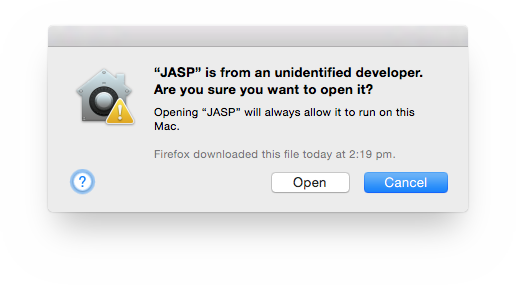 This will present a window saying that JASP is from an unidentified developer; selecting “Open” will start JASP. From then on, you will be able to start JASP in the usual way.